If you are thinking about visiting us for the first time then we hope the information below will help you to feel at home. Whatever your age or background, we will give you a warm welcome. Our aim is that whether you are just looking into Christianity for the first time or have been a Christian for many years that you should be encouraged and inspired by your visit. We hope that everyone will draw closer to God. Most people arrive between 10.15 and 10.30am. (Well to be honest there is usually a last minute scramble at 10.31am!). We have large grounds, so If you are coming by car you'll find plenty of space for parking. For directions to find us, see the Find Us page. You'll be greeted at the door by someone from our Welcome Team. You will see notices projected on the screen telling you about forthcoming meetings and events. Most people follow the words of songs and readings on the screen but if you need a large print version, just ask one of the welcome team. If you have an infant or toddler with you, there are colouring sheets to keep them occupied. Don't panic if they make a noise. We are an informal church and accept people as they are. There is no need to dress up to try and be someone that you're not. Whether you come as a suited businessman or a punk, that is fine with us. Wear whatever you feel comfortable in. If you find going anywhere for the first time to be a bit of a nerve-racking experience, then relax. To help avoid any worries here's a quick summary of what you can expect at Albany Park Baptist Church. First of all we aren't super-spiritual beings, you'll find we are a friendly crowd of ordinary people from all walks of life. Most of us still remember our 'first day' at church. If you don't understand something please simply ask. We start with what is normally called a "time of worship" where we sing songs or hymns, interspersed with some short Bible verses and prayers. Sometimes there is a time of open prayer where anyone can contribute short prayers of praise if they wish. We then may have a short family slot and another song, after which any children and young people go over to the Hall to their own activity. Babies and infants can stay in the Church if you wish. Visitors' children are welcome to go out with the other children, but if they are feeling a bit shy, it is fine if they stay in the service (although they'll miss the fun with the other children). 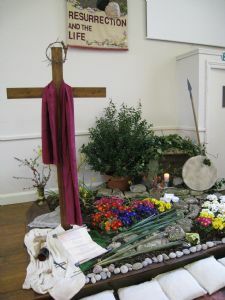 We then take our offering for the work of the church. If you are visiting, please do not feel under any pressure to contribute. We then have the Bible reading followed by a talk (called the "sermon" or "message") which applies the reading to our modern lives in a relevant and meaningful way. You can listen to our sermons on line by clicking here. After that we normally have prayer for particular situations in our church, community, country or the world. We finish our meeting around midday, with tea and coffee in the Hall. At the end of the service some people want personal prayer. If you want someone to pray or talk with you privately about what you have heard or experienced in the service, or a situation you are facing, then just go and sit on the front row and someone will come and pray with you. Once a month we celebrate communion during the morning service as well as on the first Sunday evening. This is when we share bread and wine to remember that Jesus died on the cross to pay the price for our sins. The bread and wine is usually brought to you in your seat - we eat the bread as it is served to us and drink the wine (which is served in small individual glasses) all together as a sign of fellowship. The wine is non-alcoholic. We invite all those who have accepted the Lord Jesus Christ as their personal Lord and Saviour to share in communion with us. This means that if you are not yet a Christian, you should just gently decline the bread and wine when offered. Living the Christian life is not a one day a week experience and we try to encourage one another in our daily walk with Christ. We have other opportunities for worship, prayer and Bible study during the week. These are usually in smaller groups and are a good way to get to know others in the church and to be honest with each other about everyday living. If you are just looking into Christianity you are welcome to come along to any of these meetings. From time to time we organise discipleship groups. We run Alpha from time to time, so if you are interested have a word with the Minister at the end of the service. No question is too stupid and you'll find other people also exploring God for the first time. Discipleship groups are for those who are considering taking the next step in their faith journey. To find out more have a word with or contact our Minister. We aim to be an all-inclusive church. There is wheelchair access and reserved parking near the door on the right hand side of the church. There is an accessible toilet in the Hall. We have an induction loop. If you need large print publications just ask.